The Walmart Foundation awarded a grant to support Arm In Arm’s efforts to reduce food insecurity and improve nutrition, health, and well-being among low-income community members in Mercer County, New Jersey. Trenton, NJ – A grant of $50,000 by the Walmart Foundation will have a direct and positive impact on the lives of community members who turn to Arm In Arm for food. Arm In Arm’s three choice-based food pantries and home delivery service constitute one of Mercer County’s busiest food pantry operations. 2017 will mark the third year in a row that 4,500 households receive heart-healthy food during the course of over 21,000 visits. The grant from the Walmart Foundation ensures that individuals and families will find the healthy choices they need. The Walmart Foundation supports organizations by awarding grants that have a long-lasting, positive impact on communities across the U.S. To be considered for support, applicants must have a current 501(c)(3) tax-exempt status. Additional information about the program’s funding guidelines and application process are available online at www.walmartfoundation.org. In FYE 2017, Walmart stores, Sam’s Clubs and the Walmart Foundation awarded more than $8,000,000 in cash and in-kind donations to New Jersey charities, including more than 3,664,200 pounds of food donated to local food banks, which is the equivalent of 3,053,500 meals. For more information on Walmart’s fight against hunger, visit http://foundation.walmart.com/our-focus/hunger. 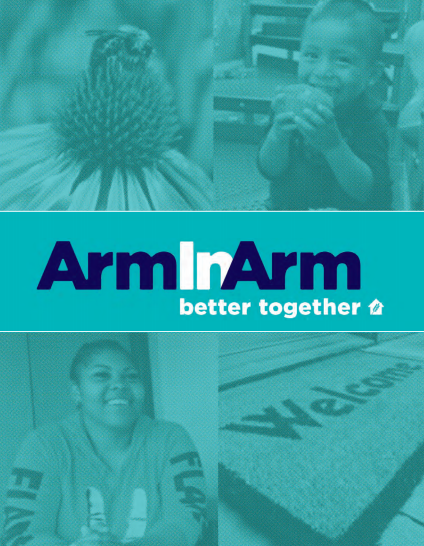 Arm In Arm, a 501 (c)(3) nonprofit organization, partners each year with thousands of Mercer County families and individuals as they improve their food security and nutrition, housing and financial stability, and job readiness. It has received a top four-star rating from independent nonprofit evaluator Charity Navigator six years in a row. More information is available at www.arminarm.org or 609-396-9355.